Pediatric emergencies can be challenging whether in small animal general practice or an emergency room setting. Here, 10 tips to help get through those challenging neonatal and pediatric emergency cases. 1) Remember, just like cats are not small dogs, at times neonates and pediatrics are not just tiny adult dogs or cats either! There are significant differences in the diagnosis, monitoring, and treatment of neonates and pediatric patients compared to adult patients. 2) Regarding neonates, the rectal temperature at birth is lower than adult patients, 95–98.6°F. This temperature gradually increases to adult temperature (100-102.5°F) over 4 weeks. 3) A physiologic heart murmur may be ausculted up until 12 weeks of age without a primary cardiac defect / concern. If the murmur is louder than expected or persists past 12 weeks, it is important to consider congenital disease. 4) The hematocrit (HCT) in neonatal puppies and kittens is lower than adult patients, reported to be 25-30% in the first 4 weeks of life, increasing to normal starting at 4-6 weeks of age. 5) Calcium and phosphorous are higher in neonates. 6) Urine is isosthenuric in neonates as they do not yet have the ability to concentrate and dilute urine. 7) Pulmonary parenchyma has increased water content and appears more radiodense in neonates. 8) Neonates have a mild increase in heart size as compared to adults. 9) Neonates and pediatrics do not have prominent costochondral mineralization giving the appearance of the liver more cranial, sitting under the rib cage. BONUS: Intravenous (IV) access is the preferred route for fluid and medication administration and when possible, should be performed. In the event an IV catheter cannot be placed, placement of an intraosseous catheter is a reasonable alternative. Fluid or drugs administered by this route are rapidly absorbed into the circulatory system. The most common sites for intraosseous access include the trochanteric fossa of the femur, the greater tubercle of the humerus, the wing of the ilium and crest of the tibia. The author’s preferred site for IO catheter placement is the proximal femur. The author commonly uses an 18–22 gauge hypodermic needle. Similar to an IV catheter, an IO catheter can should be placed in an area that is prepared in a sterile manner. When placing an IO catheter, the needle inserted into the bone parallel to the long axis of the bone. Following placement, the clinician should gently aspirate, then flush with saline to assure patency. 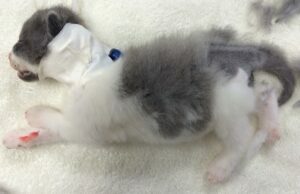 The catheter is secured with a bandage, suture, or tape preparation. Intravenous access should be attempted as soon as possible following IO catheter placement, ideally within 2 hours to reduce the risk of complications from the IO catheter such as infection, inflammation, or even fracture. 1) Johnston SD, Root Kustritz MV, Olson PNS. The neonate - from birth to weaning. In: Johnston SD, Root Kustritz MV, Olson PNS, eds. Canine and Feline Theriogenology, 1st edition. Philadelphia: WB Saunders; 2001:146–167. 4) Memon MA, Wilson O. Neonatal emergencies: How to help patients survive the critical period. 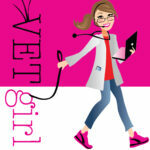 Veterinary Medicine. January 2011.